The Dedoose Code Tree is flexible, dynamic, and rich with features. Thoughtful use of code definition and weighting systems and the structure of the code tree will be central to the value of your work. Note that we use the terms 'code' and 'tag' interchangeably in Dedoose. While codes and tags may be understood to represent different things, their functionality in Dedoose is identical. Code specific editing controls appear when floating the cursor over an existing code and clicking the 'edit code' icon. Activate or deactivate the 'upcoding' feature which, when activated, serves to automatically apply any super-ordinate codes when applying a child or other subordinate code. The fourth and final button is for adding a new code. When adding a new code to the tree, you are presented with the ability to provide a title, descriptor, and activate (and set parameters for) a code rating/weighting dimension. Note that all of this information will show up as a smart-tip when floating over the code, so is a good place to note any tips or reminders on how to use the code. 'Make Root' which will move the code from any subordinate position to a root level. Finally: Be sure you are aware of the 'Quick Code Widget', you can learn more about it in this section of the User Guide. When creating a new code, you have the option of choosing a custom color. By default, the system chooses the colors for you as you work. However, for our users that are more visually inclined and like to keep things arranged in a particular way you may want to control the colors and which codes are associated with which colors. You will need to set the color scheme for your codes to 'custom' from the settings panel in the code tree. You will also want to be careful to choose colors for each code, as the default color is black and having a dozen codes all show up black can be a bit obscuring. Automatic upcoding applies the parent of any child code at the time the child code is applied to an excerpt. By default, this is deactivated and applying a child code to an excerpt will only apply that specific code. Retroactive upcoding checks every excerpt in a project and applies parent codes to excerpts that have a child code applied, but not the parent code. Note that anytime you decided to use this feature, you might want to first make a copy of the project as a backup in case the result of the procedure is not what you expected or desired. 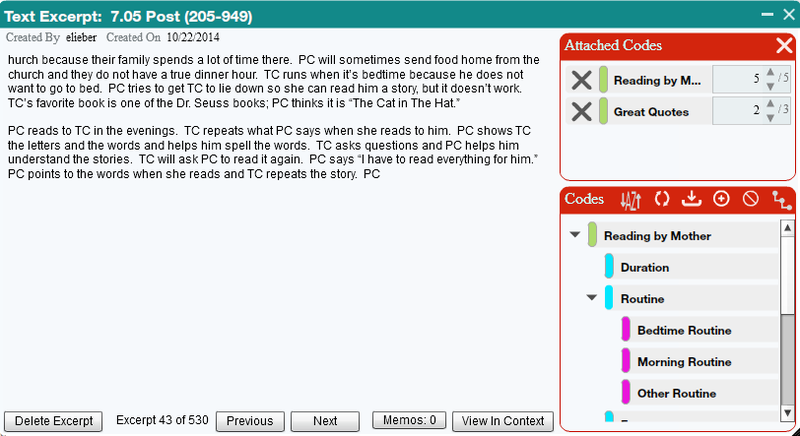 When you apply a code with the Quick Code Widget: once the first code is applied, the ’Selection Info’ panel in the upper right corner will change to orange to indicate you are in excerpt editing mode and where information about the excerpt will appear. If you have multiple codes that appear with the same subtext, typing into the search field may leave you with both so you can use the arrow keys to scroll down the list of codes and hit ‘Enter’ to apply the highlighted code of choice. To add and apply a new code that’s title exists within the subtext of existing codes (ex. 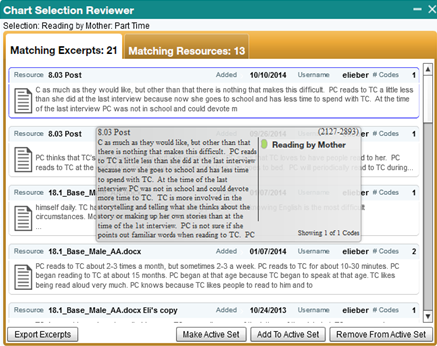 ‘reading duration’ and ‘reading frequency’ exist as codes and you wish to create new code called ‘reading’), type the name of the new code and use the command ‘Shift’ + ‘Enter’ to create the new code and apply it to the excerpt (where clicking ‘Enter’ alone will serve to apply whichever existing code that is highlighted after you've typed the name of the new code). Finally, note that the Quick Code Widget is a movable and sizable panel. Leaving the panel open means it does not need to be reactivated for each excerpt or document you are coding. Code/Tag systems can be imported and exported to and from MS Excel (and other formats) and exported to MS Word with the option to also export all coded excerpts. This feature can be helpful in the preparing of reports and for sharing code systems from one project to another. Exporting codes to a Word format also allows you to include all excerpts associated with each code, so is a quick way to export all project excerpts organized by the code tree. Note that you can also import and export codes with the 'Import Data' button and 'Export Data' buttons on the Home Dashboard. The fastest way to create and code excerpts is with the Quick Code Widget. This features allows the use of keyboard shortcuts to maximize efficiency when coding text documents. To learn more please see the Quick Code Widget section of this user guide. Excerpting and coding can also be done through a multi-step process. This is the best option if: you wish to create excerpts prior to developing your code system, if you are looking to build a hierarchical structure to your tree as you move through the excerpting process, or if you wish to take advantage of the document cloning feature. Click anywhere in the document to exit editing mode. Code weighting can be activated for use at any time. 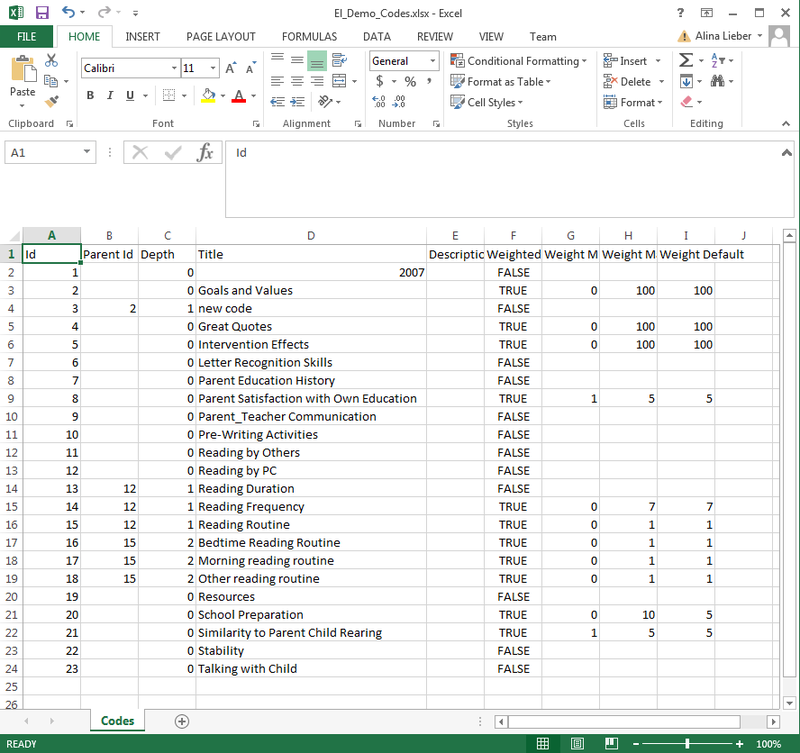 It is often the case that a meaningful code weighting system will not emerge until the nuances of meaning in the data become clearer to the research team. That is, while scalable distributions of a code may emerge when sufficient data has been examined, a useful and precise weighting scale definition and application criteria often only follows a certain amount of preliminary data exploration. Accordingly, it is often preferable to begin the coding of excerpts either without defining a code-weight system or by simply accepting a weight default value. Following adequate data analysis and weight scale definition, the weighting scale can be meaningfully defined and the user can then return to previously coded excerpts to set the weight according to the newly defined system. Applying codes with code weights to a number in documents will automatically apply that number as the code weight if it is within the range defined by the code weight minimum and maximum values you defined. The process for creating and coding excerpts on audio or video streams is similar to text except you will see either a sound wave or video in the media viewer. Clicking anywhere on the timeline to exit excerpt editing mode. Code weights or ratings can be defined and applied to indicate anything that can be represented on a numerical dimension including quality, sentiment, importance or any other dimension that can help distinguish variation in content where the same code has been applied to sets of excerpts. Dedoose also has a variety of charts that draw directly on these dimensions to expose patterns in both the excerpt content and the investigator determined ‘quality,’ ‘sentiment,’ ‘importance,’ or anything that you’ve decided to index across a code weight/rating system. To learn how to define code weights/ratings, see the Code Tree section of this user guide. When these systems are in place, there are new sets of patterns to discover and explore and lots of great ‘mixed methods’ analysis you can do…and could never do without them. Excerpts can be retrieved, reviewed, recoded, and exported from many places in Dedoose. These locations include the Excerpt Workspace and the chart selection reviewers that pop-up to show all the active excerpts (‘Hits’) after filtering or drilling-down to the sets of excerpts sitting behind any of the charts, tables, and plots—see the section on analysis for more on how clicking on portions of charts, tables, and plots, pulls up the excerpts represented in the visualizations. Open the appropriate folders in the ‘Filtering’ panel and select ‘Not Working’ and ‘Part Time’ for father work status, ‘Hispanic’ for ethnicity, and ‘Female’ for child gender. Sort by ‘Codes Short’ by clicking the column header and, voilá! Finally, one can see that floating over an excerpt will bring up a truncated view of the content and any codes that were applied. Filtering excerpts in this manner can be very convenient when searching for specific sub-sets of excerpts to explore or export across a larger number of criteria. Close the excerpt to return to the list by clicking the ‘Close’ button. As has been introduced earlier (and also discussed in the Filtering and Analysis section), reviewing and exporting filtered excerpts is an intuitive and transparent process in Dedoose. The following screenshot shows part of the Dedoose Home Dashboard where one of the basic charts in Dedoose are shown with the information that appears when floating over one of the bars. Here we see the relative frequency the ‘Reading by Mother’ code was used across ‘Mother work status’ groups. 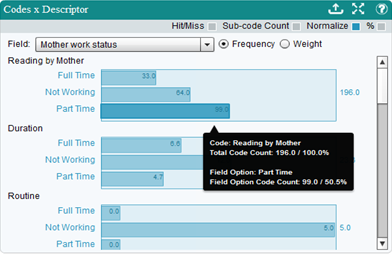 The smart tip shows the metrics on the highlighted bar (Part Time working Mothers) with reference to all excerpts with the same code. Clicking on this bar, activates a pop-up Chart Selection Reviewer containing the set of excerpts sitting behind (and represented by) the bar in this chart. The following screen shot shows this list and a pop-up containing the text of the first excerpt which has been highlighted by floating the cursor over the excerpt. Exported—clicking the ‘Export Excerpts’ button presents you with a pop-up with set of options to specify the format (i.e., .xls, .xlsx, .doc, or .txt) and information to be exported along with the excerpt (see next screen shot). Once the specifications have been set, click ‘Export’ and follow the prompts to provide a location and title to download the file to your local computer in your format of choice.